The distinctively edgy 2019 Kia Soul gets standard features that were once optional in the previous model year. They include a 5-inch touchscreen that displays images from a rearview monitor, which makes going into reverse safer; voice activation to keep your eyes on the road as you speak commands to the infotainment system; and automatic headlamps that switch on or off based on the external lighting environment. What Type of Trims Do the 2019 Kia Soul Offer? Base: Enjoy the multiple stations of the SiriusXM® audio system through six speakers that include tweeters that are mounted on the dashboard. 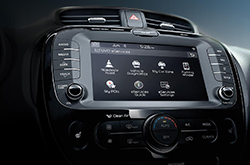 +: You'll know more with the UVO infotainment system that you can control using the 7-inch touchscreen display. Android Auto™ and Apple CarPlay™ integrate your compatible smartphone. A center console offers storage and an armrest between the front seats.
! 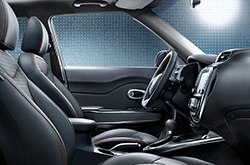 : Black cloth and leather that is accented by orange stitching covers the seats. 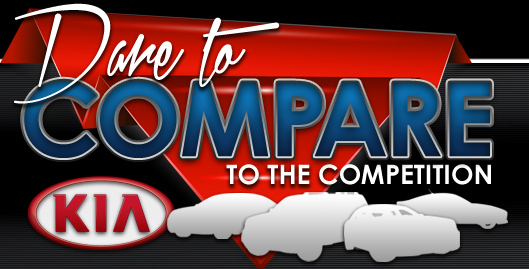 Find out how your vehicle is running through the Supervision Meter Cluster that uses a 4.23-inch Thin-Film Transistor Color LCD Display. The multiple engines of the 2019 Kia Soul all depend on 16 valves, Gasoline Direct Injection, Dual Overhead Cams, and Gasoline Direct Injection to improve performance. The fuel tank holds up to 14.2 gallons of gas. This Front-Wheel Drive is enhanced by Electric Power Steering. The 1.6-liter inline-4 generates 130 horsepower and 118 lb.-ft. of torque with the 6-speed manual transmission. The EPA-estimated mileage reaches 30 MPG on the highway and 24 MPG in the city. The 2.0-liter inline-4 achieves up to 161 horsepower and up to 150 lb.-ft. of torque through the Electronically Controlled 6-speed automatic transmission. It includes Sportmatic® to give the feel of manual gear changes. Fuel economy reaches 30 MPG on the highway and 25 mpg in the city. Finally, the 1.6-liter turbocharged inline-4 puts out 201 horsepower and 195 lb.-ft. of torque. Through the 7-speed Dual-Clutch Transmission with Sportmatic®, gas mileage is at 31 MPG on the highway and 26 MPG in the city. What Type of Safety Features Come With The 2019 Kia Soul? The passive systems begin with the side-impact steel beams that reinforce the doors and the crumple zones in the front and rear for diverting crash energies away from passengers. 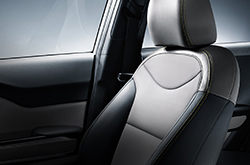 The advanced airbags cover the side curtains, both front seats, and the sides of the front seats. To control inflation, sensors can detect the presence of a front passenger and the level of impact. Helping to eliminate wheelspin as you step on the gas is the Traction Control System, which is part of the Electronic Stability Control that maximizes your handling. When the road gets harsh, Vehicle Stability Management keeps you steady. To prevent the crossover from rolling down a slope, Hill Start Assist Control holds you in place so you can move your foot from brake to accelerator. More active protection stems from available Kia Drive Wise. Its Forward Collision Warning System tells you if you're about to hit a vehicle that is slowing or stopped. Automatic Emergency Braking can stop you to prevent frontal hits. So you stay within the highway lines, the Lane Departure Warning System informs you if you deviate. You can count on Smart Cruise Control to put you at a safe distance from traffic while keeping you at the speed you want. 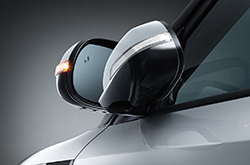 Other active safety tech includes Blind Spot Detection for warning against vehicles in your blind zone and Rear Cross-Traffic Alert for informing you when a car crosses your rearward path as you back up.